From the minute you walk in the door, you will feel the warmth and charm this home offers. Located on the Eastport side of Spa Creek, but only 2 blocks to the Annapolis Bridge, this well appointed home is used exclusively for vacation rentals so you are never competing with the owner's belongs tucked away for your visit. But unlike any other rental property in the area, this home is equipped to live in, and is a well stocked home with high quality amenities. Located along 'restaurant row', you are steps from some of the best restaurants in Annapolis. Or, walk the .5 miles to be in the heart of downtown Annapolis. With a two car driveway, parking is never an issue. This house was recently renovated with a light nautical feel, beautiful artwork, quality furnishings and comfort that you will want to come home to. 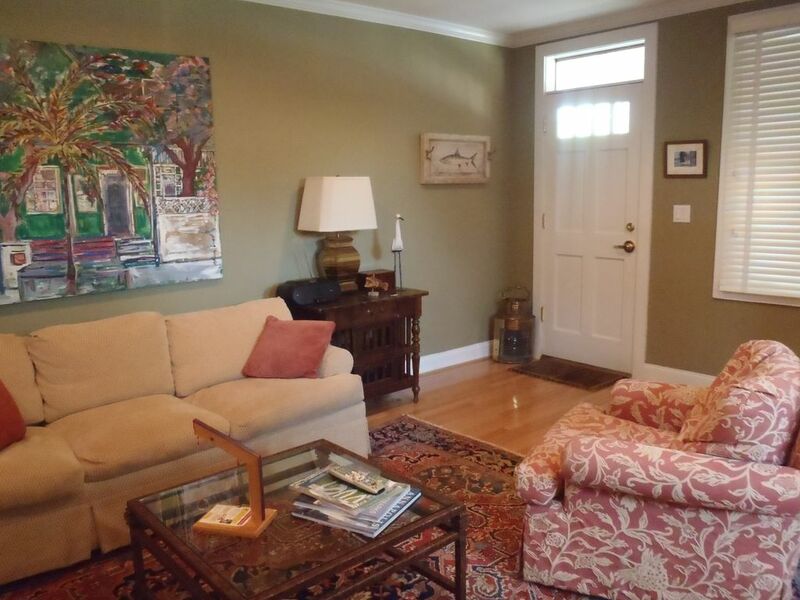 Whether your first visit to Annapolis, or you are a frequent visitor taking advantage of Annapolis' wonderful sailing and Naval Academy, this is a home you will want to keep coming back to! This clean, comfortable house was in the perfect location for a visit to Annapolis. The size was ideal for our couples weekend. Communication with the owner was fast and the check in/check out process could not have been more convenient. Highly recommend this property. The house was clean, comfortable and a perfect location for our Annapolis visit. We visited Annapolis for a Navy football game and had the bonus of it being the boat show weekend. This home was perfect !!! It offered us a back entrance to the stadium by avoiding the oldtown traffic, and allowed us to walk to the boat show, Academy, and downtown shops/restaurants. It's also very rare and convenient to have 2 "off street" parking spots. The home is extremely clean and comfortable. Each bedroom has its own bathroom and there is a powder room downstairs. The bed linens and bath towels are extra soft and the kitchen has nicer appliances than my home. Cooking our gourmet breakfast was easy each morning, and returning to the cozy living area after long days on our feet was a treat. Marie is a pleasure! She is easy to contact and cared deeply that all our needs and desires were met. We hope to return to this special spot soon ! Great place to stay - all the comforts of home in a great location. We would highly recommend this rental property. We were in town for PPW (Parent Plebe Weekend) and stayed here for 3 nights. Very easy to get to and off street parking for 2 cars. It is about a 15 minute walk into town. We did a lot of walking on the Yard so to break it up we sometimes took the Water taxi (across the street from the house at the Ciry Marina.). We were there with our 20 yr old and 14 year old. Our Plebe just came and hung out with us during the day. The house had everything we could need including a gas grill that we used twice. The beds/bedding were very comfortable as was the living room furntiture. There are plenty of restaurants all around you. We ended up right next door at the BoatYard Bar and Grill twice - once for Brunch and once for dinner. They will give you 10% off if you have a midshipman in your party. We would definitely stay there again. The property manager was very responsive and helpful. We were so excited to find this gem for our family Christmas! The location was wonderful as its only a short walk over the scenic bridge to the historic harbor and all the shops and restaurants. The house was very clean, stocked with all that we needed. There were four adults (2 parents, 2 grown kids) and we enjoyed being able to cook in the kitchen, play board games and watch tv in the living room and spread out in the bedrooms. Beds were comfy and the house was very well insulated which was nice as it was quite chilly outside!. It was definitely a wonderful first time experience renting a holiday home. Would highly recommend this place. The new favorite of transplanted Annapolitans! As a family who had lived in Annapolis and the Eastport section of town where this property is located for almost 30 years, we knew that this was probably the place for us when we booked it, and it didn't disappoint! It is next door to Boatyard Bar & Grill, which was always a favorite casual haunt, and a 90 second walk to four of the best restaurants in town. There is parking for 3 cars (if you squeeze them in - we has a Range Rover, a VW Tiguan and an Acura TSX), and you can walk to downtown in a realistic 15 minutes. Ubers are plentiful and about $5 if you don't want to walk. This section of Eastport is a great area for just strollong around, and you can see across the water to the parade grounds of the US Naval Academy from many locations. The house is small, but plenty big enough for 4 people to sleep comfortably. Both bedrooms and full baths are upstairs; a queen size bed in one and two full size beds in the other. The bathrooms are modern and clean. The main floor accommodated a pre-game party of 12 easily, and the kitchen boasts a full size and clean refrigerator and Viking stove. The kitchen itself is well stocked and leads outside to a small deck and back yard with a gas grill that we didn't utilize. Lastly, Maria, who manages the house, was very accessible and more than accommodating when we had an unexpected and urgent need to stay one more night during the Thanksgiving holiday. It's nice to know that you can count on your hosts - thank you, Maria! We almost didn't want to write such a glowing review so that we could 'save the secret' for ourselves, but like a great new restaurant, the word is going to get out anyway about this place. We couldn't have been more pleased with the decision we made to spend a week here.